Christmas Eve (December 24th, 2016) – Rev. Canon Dr. William J. Danaher Jr.
One of the things that I have, which is a peculiar part of being a priest, is that people that I know, and friends that I have, like to share with me their experience of worship in another place. I wonder if people who run restaurants have the same thing, where they’re like, “Oh, we went to this other restaurant. It was fabulous. Nothing like you’ve ever served.” But I get people who come, and they offer me lots of free research about what’s going on around me. And I am always happy to hear it. It’s always something new. There are things you can learn if you listen. But sometimes you hear something and you think, “Aha, I have a completely different understanding. I have a completely different philosophy.” I think about things and act about things in a way that is completely different from what I’ve just heard. And thank God for that. I’m happy with that. That’s the way God has called me to be. Well, one of these moments happened to me about two weeks ago. A friend of mine wanted to process this experience. She went to this huge church in Plymouth, and they had this production called The Glory of Christmas. It’s an extravaganza that has two acts with an intermission in the middle. And in the first act, there is secular Christmas. There’s fireworks, and there’s ice skating on real ice. There is Frosty the Snowman, and there’s Santa Claus who descends on a sleigh that is suspended by wires down to the center stage. It’s all secular Christmas. And then there’s an intermission, and then you come back, and it’s all a recreation, a historical reenactment, as they understand it, of Jesus’s birth. So you see an angel suspended on wires that comes in and does the annunciation to Mary. And you have Mary and Joseph find themselves in a very realistic looking manger in a little stable. They have a camel; a living camel comes onto the stage. And then you see Jesus born, a little baby. And then you see Jesus, a grown man welcoming children and healing people. This little girl leaps to life in his arms. And then they have a realistic crucifixion. And then they have a realistic resurrection, and then finally, there is a final hymn and song where they proclaim Him King of Kings and Lord of Lords. It’s an extravaganza. And my friend needed to process it because she wasn’t sure how to experience it. So she went up to the senior pastor, and she said, “Why do you create your services this way?” And the senior pastor said, “What people are looking for today at church, is they want to be welcomed and they want to be anonymous. And they don’t want any obligations placed upon them. And this service meets that need.” It was at that moment that I realized that I had a philosophical difference. But before I tell you about that philosophical difference, I want to say one thing, that it’s not my intention tonight to run down any other church. It is a beautiful thing when you find a connection with God. And I believe that when there is an authentic celebration of the Holy within us that there is something powerful taking place. Because I believe that joy is joy, is joy, is joy, is joy. Just as I believe that love is love, is love, is love, is love. And whenever we see joy and love in this world, we are right to say to ourselves that we have witnessed a small miracle. Because there isn’t enough joy in this world. And there isn’t enough love in this world, and anything that brings out those things, that is a good thing in and of itself. But I have a philosophical difference. And it’s not the fact that, that church is doing a performance and we’re not doing a performance. We’re actually both engaged in a performative moment. There’s a performance going on here just as much as there’s a performance going on at that church. But the fundamental difference I think is this. At that church, the performers are on the stage, and the audience is sitting in their seats watching. And in this church, the way this has been configured, the way we do church here, our philosophy of church, our understanding of God at work in the world, the performance we’re doing is one in which it is God who is the audience, and you are the performers. And people like me and the musicians that we have, and the wonderful choir, we are merely the prompters. We feed you the lines. You are the performers. You get the text in your hands, and through the life you live, you bring that text to life. Now, all of this has everything to do with Christmas. That church wants to make the meaning of Christmas real for people, and God bless them, they do it by creating this realistic narrative. And it’s a narrative that they hope can comprehend all of the different themes and images, and symbols that Christmas is for so many people. But I want to suggest to you that Christmas becomes meaningful not through some kind of historical reenactment. Rather, Christmas becomes meaningful to you when Christ is born in you as Christ was born in Mary. One of the first ways of thinking about the virgin Mary before there were theological debates for how it was that God could become human through a woman, the first understanding of Mary is that she is the first Christian, literally. Because Mary bore Christ within her. And the promise of the gospel is that those of us who place God at the center of our lives, those of us who receive Christ in our hearts experience the birth of Christ within us. So you are not anonymous here today, and you all bear a responsibility. You are not anonymous because there are no accidents in this world. And the fact that Jesus came to us in all of the particularities of his life at a particular time and place, and historical context in which there was violence and upset and upheaval, in which there was incredible chaos and instability, God becomes human, and becomes vulnerable. God performs this incredible act of love. And that performance is now completed and fulfilled, and God is now in the audience waiting for the response of the performers. And that responsibility, if you will, is the source of all the obligations you have. I do think that pastor is onto something when he says, “We don’t ask people to do anything. We don’t place any obligations on them.” Because I do think that one of the ways in which we live our lives today in this time and this place is we feel obligated all the time. And we are weighed heavy by the obligations upon us. Whether it’s our families or our work, or our friendships, or any of the networks we’re part of. And God has come into this world to liberate us. To free us from all of that. But we are freed through being responsible to the love God shows us first. And God knows us from eternity. When God was imagining this moment, this night from eternity, God decided that this night would be incomplete without each of you in all your particularity, with all the struggles you’ve had, with all the challenges you’re faced, with all the gifts that you have, with all the accomplishments you’ve had. With all the joys you’ve had, with all the sorrows you’ve had, with every grief that you’ve borne, God has brought you here to this time and this place, so that you might put on a performance and know God fully, as God knows you through Jesus Christ. That is the meaning of Christmas. And that can’t be put on by any kind of historical reenactment. It doesn’t happen 2,000 years ago alone. Christmas happens today, now in this time, in this place, in your life. The scripts we have read to you, how will you interpret them in your context, in your life? What will you do? What will you say? The curtain is rising. The spotlight is on. You have to step forward and speak. What are the words you’ll say? In what way can you give the performance of a lifetime? That is what it means to make Christmas meaningful today. I have an illustration for tonight. It’s from Marc Chagall’s incredible stained glass window. It’s not often covered in surveys of Chagall, but it’s so important, and I hope you can see why. Chagall was a Russian Orthodox Jew, living in what is now Belarus. He was a refugee twice over. He had to flee the Communist regime to France, and then when France was occupied during World War II, he became a refugee again. And his artwork consistently worked out themes from his own particularity instead of being anonymous in facing his identity as a Jew. Chagall actually drew upon his fundamental identity, and often took on Christian symbols and images in order to speak a more universal language, so that we might see in these images of Christ something to ponder about our own faith. And one of the most powerful stained glass works of art that he did is this one called, “Vitrail de la Paix;” this is called the “Window of Peace.” And in it, you have this incredible tree of life that is blooming out. And to the left you see Adam and Eve, which is a recreation of creation’s original intention, the original intention of creation to be good. And all around it, there’s this enveloping color that is coming out. It’s bursting out of the seams, and around it you see the cross over to the left, and Moses’s tablets to the right in gray. These are the things of history and historical existence. These are the things in which there is tragedy and challenge, but this life is still blooming out. And the source of the life goes right down to the bottom of the stained-glass window. It’s at the base of it. And if you turn around the piece, you can see that at the base is the virgin and the child. And this was Chagall’s take on a famous Russian icon, the “Virgin Hodegetria;” the “Virgin as Our Guide” is the Greek. It’s a rough translation and an even rougher pronunciation. And that icon in Eastern Orthodoxy had always been portrayed in gold and jewels and silver and wonderful things. But in Chagall’s hands, the power of that icon, the power of that image, the power of Christ, the power of the virgin is rather a power of life over death, of love over hate, of color over gray. 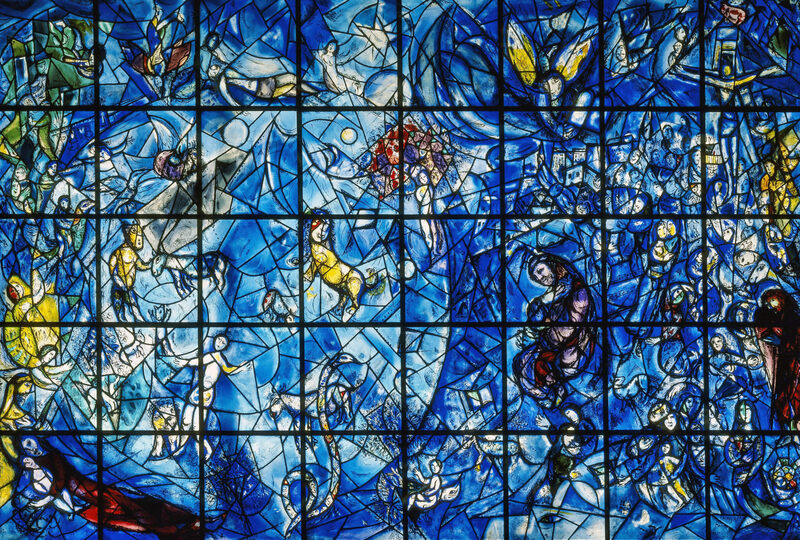 In 1964, Chagall gave a speech at the UN after they dedicated another window that he called, “Peace.” And in it, he said that his stained glass was a transparency between his heart and the heart of the world. For Chagall, the stained glass was his performance, his way of affirming that he was not anonymous, that he was called by God to be exactly who God called him to be, and to share that with the world through this beautiful image of the virgin and child. For this universalizable image he once said of the virgin and child. What is your heart calling you to proclaim to the heart of the world? What is your performance this night, this evening, this 2017, and what way can you reaffirm your identity as known and loved by God? And how can you claim, and be in your own way, the bearer of Christ? For all that we give is but an echo of all that we have received, for as much as we can say that we love God. God in Christ has loved us first. And that is the meaning of Christmas. Amen.